In images widely circulated by Brazilian social media, some residents resisted the violent occupation with Residents resist eviction. Credit: Indymedia.org.uk.improvised weapons and homemade body armor. Numerous videos posted on YouTube captured incidents of police brutality. 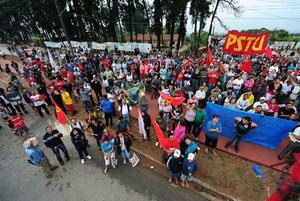 Reports indicate scores of injuries and at least 30 arrests, with unconfirmed rumors of up to seven deaths. Residents rally. 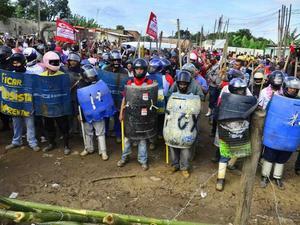 Credit: indymedia.org.ukIn part, the episode stems from a judicial and political dispute between the state of São Paulo, run by the opposition Social Democratic Party (PSBD), and the federal Workers' Party (PT) government. After a state court upheld the state government’s request to repossess the land (for purposes not made clear), a federal court suspended the order. The federal government said it would buy and regularize the land and turn it over to the residents under a government program. But a second state court reversed the ruling, and before the action could be further appealed, the state moved to occupy the favela. But the real story behind the evictions is about poverty, housing shortages, unequal land distribution, and the consequences of Brazil’s economic and development boom. 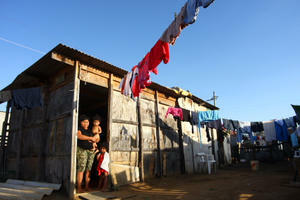 While six out of 10 Brazilians are now thought to belong to the “middle class,” another 11.5 million live in substandard and often illegal housing—up from 4.5 million in 1991, according to recent government reports. 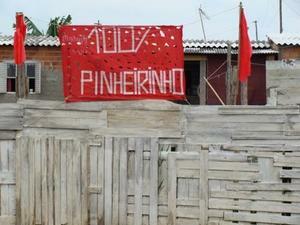 Pinheirinho housing. Credit: Kathiao/ flickrBrazil already has a deficit of some 7 million housing units—and now, another 1,600 homeless families. According to Brazilian philosopher Rodrigo Nunes, the real culprit behind the Pinheirinho evictions is the “gargantuan developmentalism” that characterizes the left-leaning government of President Dilma Rousseff, accelerated by the upcoming 2014 World Cup and the 2016 Olympics. The National Coordination of World Cup Committees estimates that up to 170,000 people across the country will be evicted in preparation for these events. Some activists put the number as high as 1.5 million. Key transit, stadium, and port development Credit: indymedia.org.ukprojects in Rio de Janeiro have led to substantial charges of forced displacement by international human rights organizations. For more coverage on Brazil, see the March/April 2011 NACLA Report, "Lula’s Legacy in Brazil," or Emily Achtenberg's June 9 post "Brazil Without Poverty? Dilma’s Double Discourse." Read more from her blog Rebel Currents.